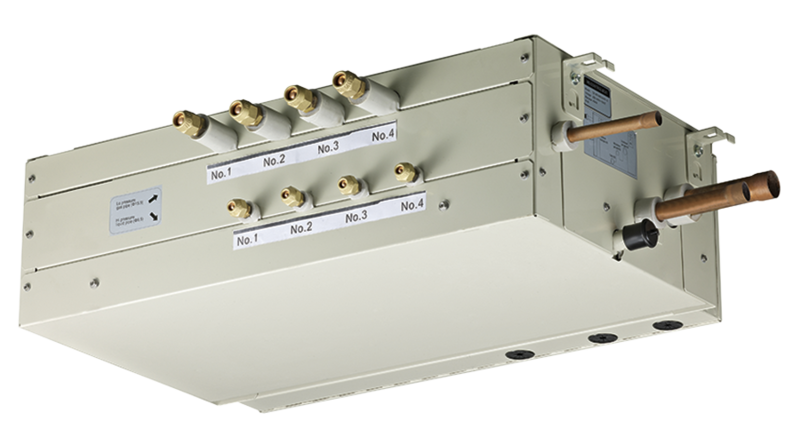 The MS Box is the key component to the Lennox VRF Heat Recovery systems. It offers flexible installation configurations in 2-, 4-, 6-, 8-, 10-, and 12-port models, with each port featuring a dedicated subcooling circuit. Integral hot gas bypass control maintains minimum suction pressure during part load operation. Zoning Flexibility—Combine up to 5 zones with similar load profiles on a single port (up to 54,000 btu/h per port), with up to 20 indoor units and 168,000 btu/h per MS Box. Twin Ports---Twin ports together for indoor units above 54,000 btu/h. Versatile Design --- MS Boxes can be piped from either side, allowing maximum design flexibility even in buildings with limited spacing. Integrated Suction Pressure Protection—An integrated hot gas bypass valve provides an additional measure of compressor protection by helping maintain minimum suction pressure during low load conditions. Heat Recovery—MS box operation allows condensed liquid refrigerant to flow from an indoor unit in the heating mode into an indoor unit in the cooling mode, reducing waste heat rejected at the condensing unit and improving the overall operational efficiency of the heat recovery system.